Post Photo's or Video of Cool Art you Made or Seen on the Net. 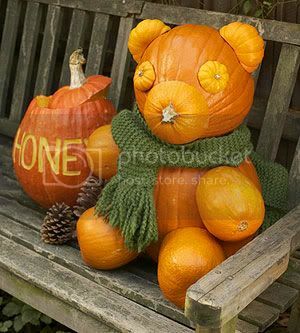 You'll need classic orange pumpkins in all different sizes to make this honey bear. 1. To make the body, attach a medium-size pumpkin to a larger pumpkin with a 3/4-inch wooden dowel (use a drill to make holes in each). 2. For the arms and legs, cut the top off of orange gourds, hollow out, and attach to pumpkin body with 1/2-inch wooden dowels. 3. Use Jack Be Little pumpkins for the face. Cut one in half for the ears, cut two in half for the eyes (use the pumpkin tops with stem). 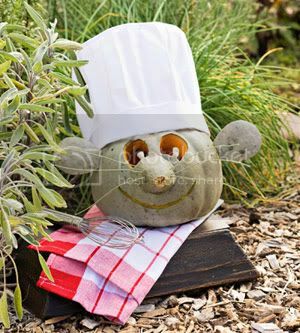 Make bear's snout with a small orange pumpkin, halved and hollowed out. Attach to head with bamboo skewers. 1. 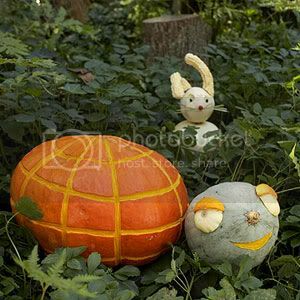 Start with a large pumpkin stem side down and carve lines in the "tortoise's shell" with a fruit and vegetable corer. 2. To create the eyes, slice two Jack Be Little white pumpkins in half, and secure to medium-size pumpkin with bamboo skewers. Quarter one orange Jack Be Little pumpkin and discard inside to create the eyelid. Secure with hot glue. 3. Etch mouth shape using a fruit and vegetable corer. 4. Place four Jack Be Little pumpkins for feet and one small squash gourd for tail. 1. 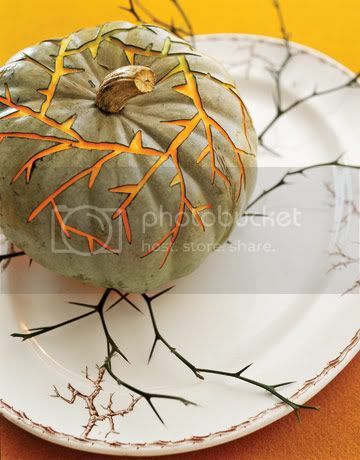 Attach two white pumpkins together with 1/2-inch wooden dowel (use a drill to make holes in each). 2. Use a melon baller to create eye sockets and press a straight pin through a black pom-pom into the center. 3. Hot-glue strands of raffia under a cranberry for whiskers and nose. 4. Cut the tail ends off of two gourds and attach to the head with skewers as ears. 1. 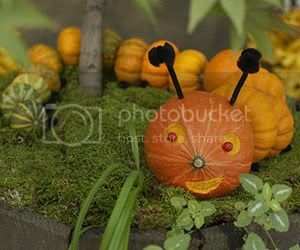 Arrange Jack Be Little pumpkins in a curved line (best to place them on a soft surface like grass or moss). 2. 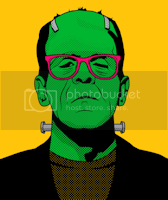 Use a melon baller to create the eye sockets, and then stick a straight pin through a cranberry and into the center. 3. Use a fruit and vegetable corer to etch mouth shape. 4. Dig two small holes into the head with a pointed object to insert the chenille stem antennae. A gourd with a long, curved stem becomes a purr-fect cat body and tail. Use teeny white turnips for the mice. 1. Attach pumpkin to gourd with a 1/2-inch wooden dowel (use a drill to make holes in each). 2. 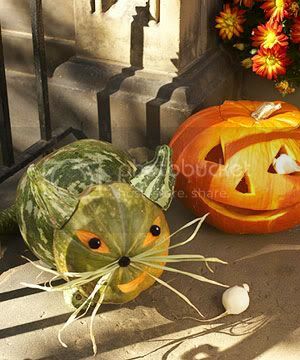 Cut two triangular gourds in half and attach to top of pumpkin with skewers as ears. 3. Etch eye and mouth shapes using a fruit and vegetable corer, and attach black pom-pom to eyes with straight pins. 4. Hot-glue strands of raffia under a black pom-pom for whiskers and nose. 5. Place two small gourds at front of body for paws. 6. To make the mice, peel and shape turnips into a egg shapes. Cut small triangle shapes from a separate turnip and pin on as ears. 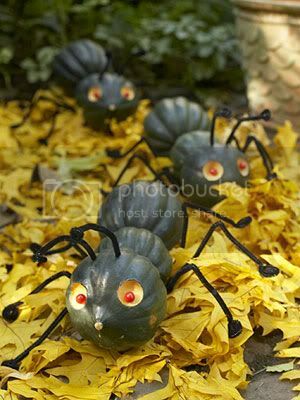 Black chenille-stem legs and cranberry eyes bring acorn-squash insects to life. 1. Connect three acorn squash together with a bamboo skewer. 3. Dig two small holes in the top of the "head" with a pointed object and insert chenille stems for antennae. Twist six chenille stems together and hot-glue to the bottom of middle squash. Originally published in the October 2008 issue of Parents magazine. 1. Cut out the bottom of each pumpkin. Save the bottoms to support the candles. 2. Trim the stem on the body pumpkin even with the top of the pumpkin. 3. 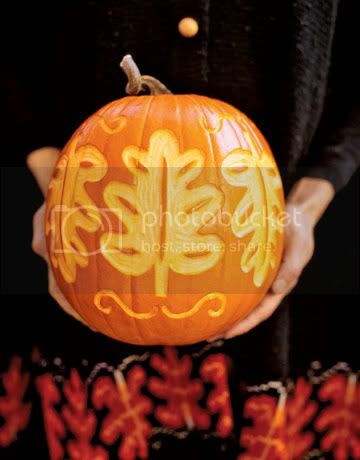 Transfer the patterns onto the pumpkins. 4. Using a knife or carving tools, cut out the openings. 5. Use a gouge to carve the tongue, eyes, and chest, carving just deep enough to reveal the inner rind. 6. Secure the gourd tail, ears, and feet with wood skewers. 7. Add a half radish for the nose, with a skewer or toothpick. 8. 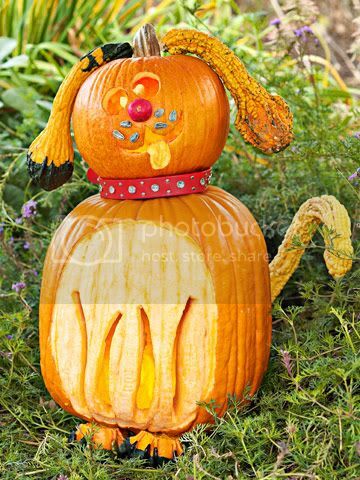 In the same way, secure the (saved) bottom of the head pumpkin to the top of the body pumpkin. 9. Add the candle, and then place the head over the top, securing it with skewers. 10. Hot-glue sunflower seeds to the face for whiskers, and wrap the neck with a collar. 1. Use a grey pumpkin for the rat. Cut a circle from the bottom of the pumpkin. 2. Transfer two ear patterns to the circle. 3. Transfer the eyes and mouth patterns onto the pumpkin. 5. Use a gouge to carve a thin mouth, carving just deep enough to reveal the inner rind. 6. Use half a gourd for the nose and attach it using wood skewers. 7. Push pieces of floral cloth wire into the nose for whiskers. 8. Add a chef's hat, a wire whisk, and checkered dish towel to complete the design. 1. 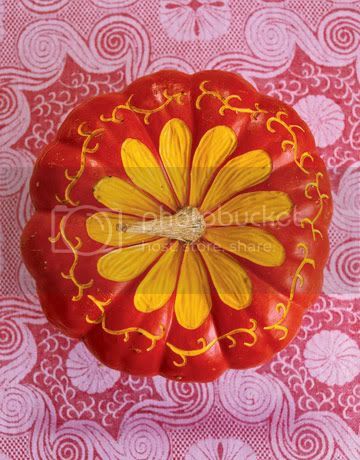 Transfer the patterns onto pumpkins. Editor's Tip: Use a gray pumpkin to make an alien. 2. Using a knife or carving tools, cut out the openings. 3. Use a gouge to cut into the teeth, cutting just deep enough to make them "pearly-whites." 4. Drill large holes into the pumpkins to receive the gourd antennae (for the left and center pumpkins) and the gourd nose (for the far-right pumpkin). 5. Paint the outside of clear plastic ornaments in bright colors for eyeballs. 6. Cut large white circles and smaller black circles from crafts foam for eyes. 7. Glue the circles together and add red veins using a felt-tip marking pen. 8. Hot-glue the eyes onto the painted eyeballs. Except for the one-eyed alien, hot-glue the assembled eyes in place. 9. 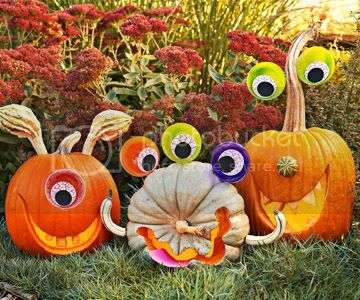 For the one-eyed alien, cut a circle in the front of the pumpkin and slip an eyeball in place. 10. If desired, cut a tongue from pink crafts foam and slip it into a mouth. 1. For an instant nose, choose a pumpkin with a long stem. Place the pumpkin on its side. 2. Carve a small slit below the stem to insert wax lips. 3. Push two post earrings into the pumpkin for the eyes. 4. Keeping the eyeglasses folded, set them in place and mark a dot at each temple. At each dot, cut a slit large enough to slip the eyeglasses arms into the pumpkin. 5. Use long pins to secure chandelier crystals (or crystal beads from crafts stores) for easy earrings. 6. 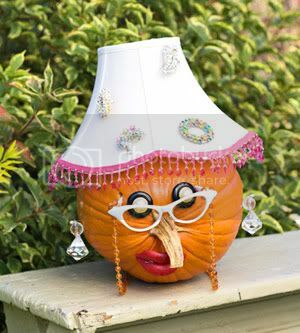 Top the pumpkin with a lampshade that fits the shape. Use hot glue to decorate the lampshade with costume jewelry pins and beaded trim.